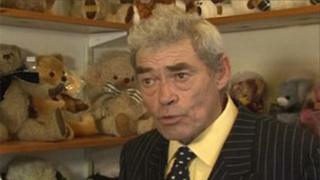 The owner of the Merrythought toy factory in Shropshire has died of cancer aged 60. Oliver Holmes was the third generation of his family to take on the business in Ironbridge, which started in 1930. Merrythought recently won the contract to produce the official 2012 Olympic teddy bear. The company went into liquidation in November 2006, but production restarted in March 2007 on a smaller scale. His daughter Sarah, who is taking over the running of the company, said her father had worked until 10 days before he died on 30 April. "He had an enormous sense of pride and I think a certain amount of duty to make absolute most of this and leave the legacy for the next generation to build on," she said. She described her father as a "big character". "He was a very outgoing eccentric character. He was the sort of person who anyone who met him never forgot him. He had a wicked sense of humour, often not the most politically correct, but always entertaining," she said. Miss Holmes said her father had been a great adventurer and recently completed the Peking to Paris Motor Challenge. He had previously been a hot air balloonist and had flown all around India and across the North Pole. A memorial service for Mr Holmes will be held at Much Wenlock Church on 27 May.